Pesky phone always ringing at just the wrong time? Worried about your phone transmitting data even when it's off? Make a simple cell phone sleeve from conductive fabric to block RF transmissions. 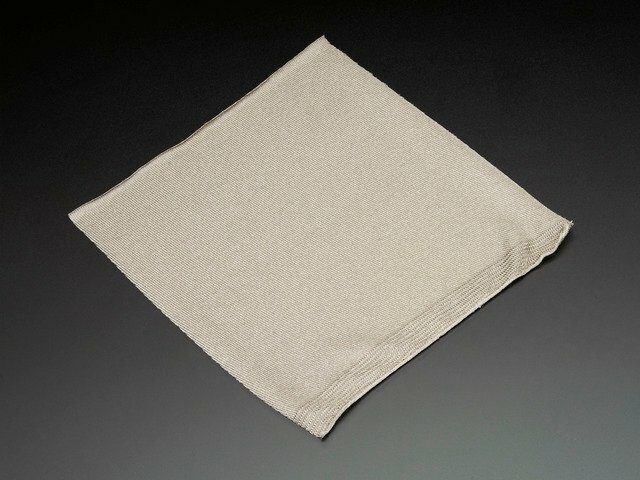 Not all conductive fabrics block the same frequencies of RF or at the same effectiveness. We found the shiny knit silver plated fabric in the Adafruit shop to be the most effective across wifi and cellular ranges, based on anecdotal testing with various phones. Layering different types of conductive fabric may yield better frequency coverage, much like having multiple active ingredients in sunscreen. LessEMF does frequency blocking tests on their textiles and reports a graph of their shielding performance-- our silver stretch is similar to theirs. In our tests we also tried this pouch with NFC/RFID, and it did not block the phone from scanning a tag, nor did it stop an RFID entry tag from unlocking its door. Lay out your fabric and fold it over your phone. Pin it to size. The stretchy fabric is very forgiving, so don't worry about it being perfect. Use a straight stitch, either on your sewing machine or by hand, along the pinned edge and then perpendicular to close one end. If you are making a standalone pouch, turn the form right side out and fold over twice before adding a piece of sticky velcro to act as a closure. You're finished! Here we tried to capure a photo of the phone losing service-- you can see that wifi comes back pretty quickly if any of the phone is exposed, but cell service is totally out. If you'd rather make your jacket pocket a cell dead zone, fold over the open edge of the pouch while it's still inside out and stick it in your pocket, using a whip stitch to secure the edge. Experiment with different configurations and show us what you made! Enjoy your pocket at the movies, out on dates, or at Edward Snowden's hideout. This guide was first published on May 28, 2014. It was last updated on May 28, 2014. This page (Make it!) was last updated on Apr 18, 2019.